NEHD’s 30-bed skilled nursing/long term care unit is staffed by registered and licensed nurses as well as certified nursing assistants who are educated in ASL and Deaf Culture. All resident rooms and common areas are equipped with state of the art technology for optimal safety and communication accessibility. The building’s safety and security systems are enhanced with accessible flashing /signaling devices. Resident rooms are oversized and feature flashing doorbells, high speed internet access and private video phone hookup. Many rooms overlook the beautiful riverfront and neighboring marina. 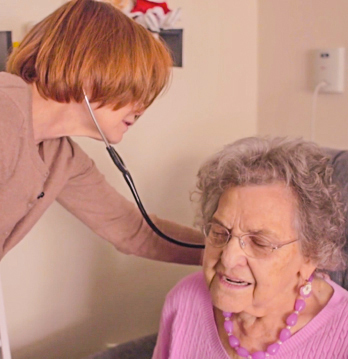 Attending physicians, including a medical director and nurse practitioner, work regularly in collaboration with the staff and have an active, ongoing communication that results in exceptional resident care. NEHD is fully certified by the Massachusetts Department of Public Health, Medicare and Medicaid, and has consistently received outstanding survey results from the Department of Public Health. A full range of clinical and rehabilitation services for short and long term stays is available and listed below.